I am so excited to share with you my debut quilt with Moda Bake Shop called Lollipop. Visit the bake shop and view all the great recipes from many talented quilters using Moda’s beautiful range of fabrics. « “Fall into Fall Quilters Blog Giveaway” – and the winner is ………. How cute is that! 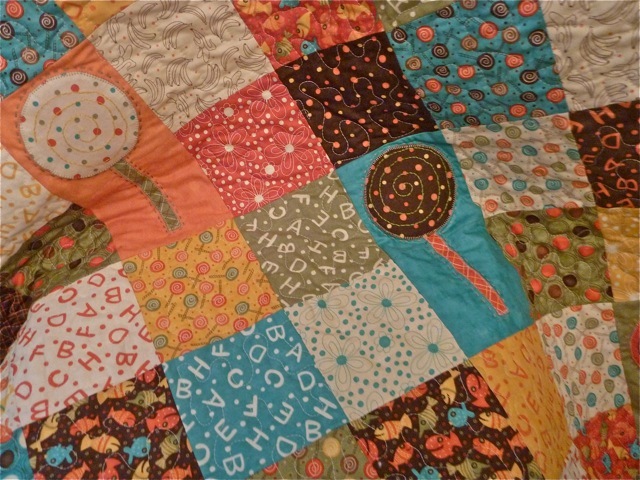 My granddaughter would love it – she thought my latest quilt looked like lollipops! Congratulations on being on MBS!! I love how fast it is to make. I must visit Moda Bakeshop more often. What a beautiful quilt. Love the colors you used and also the design is great !! I saw the quilt on my blog list (I follow moda bake shop)and thought I'd have to go back and have a look at it as my little girl would love it. Didn't realize it was your design! Congratulations! It's a gorgeous quilt. This was YOURS?!?! I saw it on Moda and loved it right away! Am going to make this for my sweetie-daughter! Well done on your debut on Moda Bakeshop!! !